– We write a post on our blog. – You want to comment on our post, but you want your own readers to see what you have to say and able to comment on it. – You will then write a post on your blog and send a trackback to our blog post. – We will receive your trackback, and choose to display it as a comment or not. 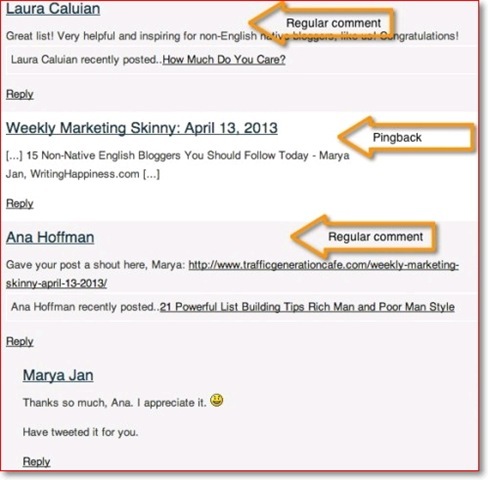 The comment display will be a title, excerpt and a link to your blog post. Pingbacks give softwares the ability communicate between websites. Its almost like remote comments. – You write a post on your blog mentioning/linking to our article. – Your blogging software will automatically send us a pingback. – Our blogging software will receive the pingback. It will then automatically go to your blog to confirm that the pingback originates there (the link is present). – Then we will have the ability to display your pingback as our comment. This will solely be a link to your site. What is the difference between Trackbacks and Pingbacks?